The world is full of Star Wars fans who own an Apple iPad so for you iPad toting Star Wars fans out there we have some video footage for your viewing delight below that offers some of the Star Wars Blu-ray collection’s bonus material by way of the Star Wars Blu-ray: Early Access App for the Apple iPad. The Star Wars Blu-ray app for the iOS tablet walkthrough video comes our way courtesy of the guys over at Engadget and delivers a cool almost five minutes of checking out the Star Wars Blu-ray app for the Apple iPad. 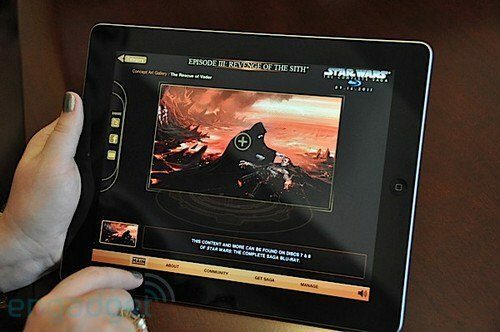 According to the guys, the iOS app itself is a ported version of what the user will see on the Star Wars Blu-ray discs along with some touch screen functionality whereby the user can spin models and props along with the ability to pinch and zoom on the concept art, and includes never-before-seen content sourced from the Lucasfilm archives. The complete Star Wars saga is coming to Blu-ray as of September the 16th and this early access iOS app for the Apple iPad delivers some drooling ability for the ardent fan of the hugely successful Star Wars phenomenon, or which I am one. Apparently the Star Wars Blu-ray: Early Access app for iPad enables the user to “selectively download” content so that all the video and artwork does gobble up loads of your tablet’s memory. The guys got a chance to check out the iOS app and they say it was easy to use whilst delivering compelling content, but were left wishing that there was even more content, albeit being able to get a nice close up examination of the Death Star. Apparently though and something that comes as somewhat of a disappointment is that the majority of the extra content is reserved for those that purchase the Star Wars Blu-ray collection on the 16th of September and apparently there are no plans on delivering all that extra content to the iPad app even if you do purchase the collection. Anyway, the Star Wars Blu-ray: Early Access app for the Apple iPad is available to download as of right now from iTunes for free for those eager Star Wars fanatics to grab, and I’ll leave you there to head on down and mash that play button to check out just what the app offers…enjoy.